The Bintiva children's ball chair is designed especially for children, and includes wheels that can lock in place. The ball chair is an exciting way for children to sit, while promoting healthy posture, and proper spinal alignment. 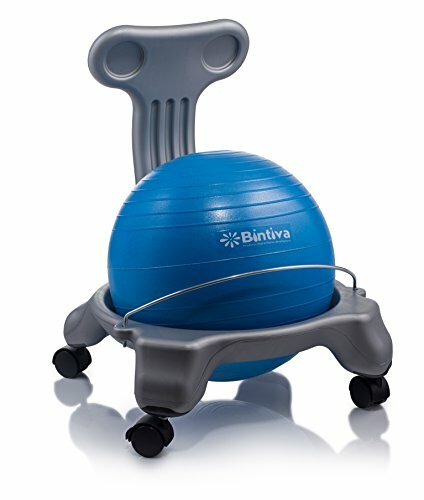 The chair combines the benefits of a therapy / swiss ball with the convenience of a real chair to hold the ball in place. The chair is also recommended by educators for children that have trouble sitting still in the classroom. The ball chair allows them to wiggle, and move, while staying seated. The Ball Chair is 15" - 15.5" off the ground, and is recommended for children between ages 5 - 8, depending on the child's size. If you have any questions about this product by bintiva, contact us by completing and submitting the form below. If you are looking for a specif part number, please include it with your message.